Most of us, knitters included, want to do our part for the planet, but it can be hard to know what that means. What makes a yarn organic? Are natural dyes safer than chemical dyes? From selecting organic yarns to reusing yarns to knitting warm projects (and turning the heat down), there are a variety of ways to knit green. Leading knitting industry figures, including designers French Girl Kristeen Griffin-Grimes and Kristin Nicholas, yarn company creative director Pam Allen, and writer/editors Amy R. Singer (Knitty) and Clara Parkes (Knitter’s Review), offer their perspectives on integrating green principles with their work and lives. 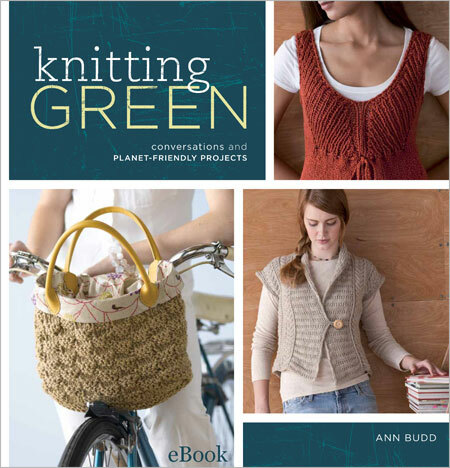 In addition to the articles and personal essays, Knitting Green includes 20 contemporary projects from top designers for garments, accessories, gifts, and home furnishings, all designed to use earth-friendly yarns or to serve an earth-friendly purpose. In addition to Ann Budd, designers include Pam Allen, Mags Kandis, Deborah Newton, Vicki Square, and more.